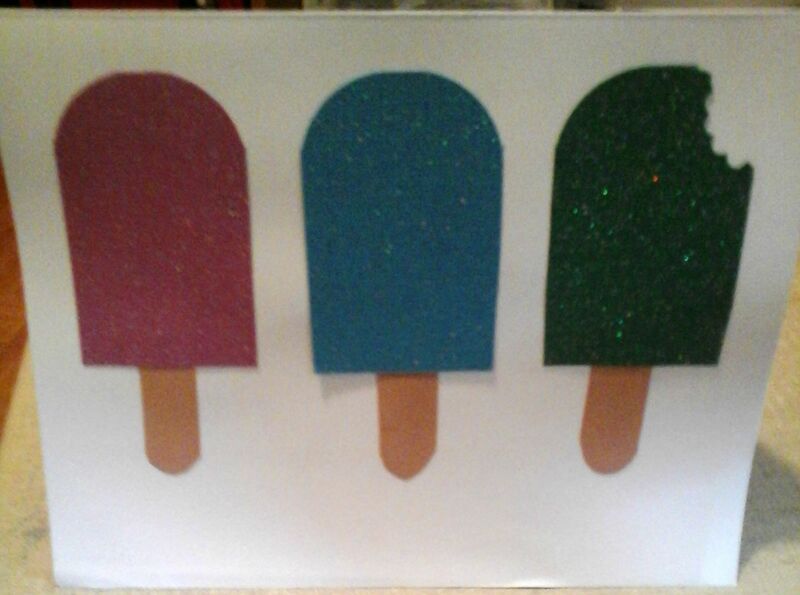 Use a ruler to make 3 rectangles on 3 different glitter papers. Then use a corner rounder to round the top 2 corners. For the popsicle stick (brown card stock), the corner rounder I had didn’t work – the stick was too skinny for that! I just used scissors, hence why they are not identical. For the “bite”, put the corner of the popsicle shape into a scalloped oval punch (looks like a cloud). A pin posted from http://www.pinkcricut.com/ (no direct link) inspired this post. Thanks for the inspiration! This entry was posted in Cards, DIY, How-To and tagged birthday cards, blank cards, card, cards, DIY, do it yourself, every day cards, how to. Bookmark the permalink.